For more information, visit the publisher's website or the author's website. 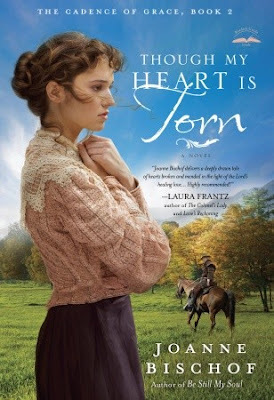 Though My Heart is Torn is one of the best Christian fiction books I have read in a long time. Author Joanne Bischof (a homeschooling mom) weaves a beautiful romance story with lovely characters and an exciting plot in this second book of the Cadence of Grace series. The love portrayed between Lonnie and Gideon is beautiful, and as their faith and love are tested, a belief that God is leading them helps them endure trials and hardships and build their marriage. The likable characters and the Appalachian setting combined with the author's compelling writing style to immerse readers into Lonnie and Gideon's world, and the book leaves me wanting more -- I’ll be eagerly anticipating the next book in the series! After a difficult beginning, Lonnie and Gideon have developed a deep love for one another, and their future seems bright until they are tricked and their world falls apart. Their love is tested in surprising ways. Gideon is faced with hard lessons to learn, and he must deal with the consequences of his past. When they must live separate lives, Lonnie's faith holds her together; she puts her complete faith in God and knows everything is in His hands. Gideon tries to do the "right" thing, but he longs to be reunited with his true love. Though My Heart is Torn shows that though the characters experience so many setbacks, their reliance on God and trust in His guidance actually strengthens their faith and their love.